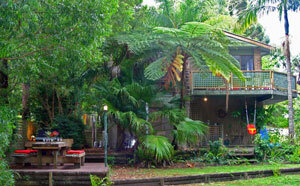 The Hideaway Jervis Bay is a beautifully furnished 4 bedroom holiday house backing onto Jervis Bay National Park. The Hideaway is a modern, contemporary-styled beach house with everything that you could want & more to ensure a relaxing and memorable holiday for all. Sleeping up to 10 people and positioned just metres from the beautiful white sands of Greenfield, Blenheims, Chinamans and Hyams beach – it truly is a piece of paradise. There are fantastic bush walks direct from the house and the birdlife is just glorious. Just two minute's bush track stroll to Greenfield’s Beach, the house is child/family-friendly and includes a large garden area spilling onto the National Park. The house is set back from the road so you are unlikely to see or even hear a car! One thing you will hear though is the gentle, not-too-distant sound of the waves crashing on the beach…aaaaah bliss! Fantastic for young families or for get-togethers with good friends, The Hideaway is without doubt, one of the best holiday houses on Jervis Bay and an easy 2.5 hour drive south of Sydney. ...everything you need to relax and unwind.